Kostanjevica na Krki is one of the smallest and oldest Slovenian towns. It’s the only town in Slovenia where its historic centre is located on an island in the middle of the Krka river, which makes this town unique worldwide. It’s also the only town in Slovenian that didn’t need a defensive wall in the past. It’s located below Gorjanci in the south-eastern part of Slovenia, between Zagreb and Ljubljana. There are two stone artefacts (plates) from the stone age and a prehistoric boat, found in the river Krka, next to Kostanjevica, that serve as proofs of an early territory colonization. The town, as we know it today, originates directly from the middle ages in the 13th century, when the areas in the lower part of Krka started to get owned by the Speinheim dynasty with the duke Bernard, who had the most influence in the development of Kostanjevica. It’s first medieval name was Landestrost, from the German language, meaning trust, courage of the land, and it also owned a money mint. 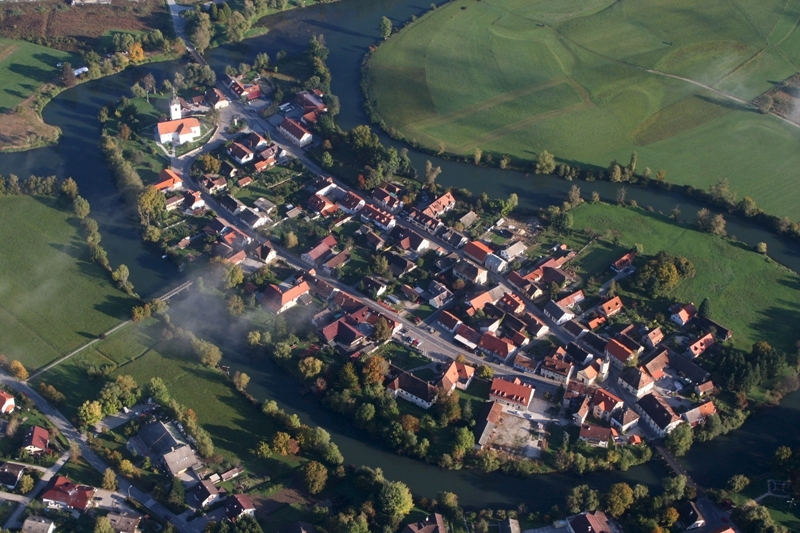 In 1252, the town was given its town rights and consequently became the first town of Dolenjska with its own rights. Through time, Kostanjevica started losing importance in the region. It was because of floods, fires, the plague, Turkish invasions, the Reformation, etc. This decline was momentarily interrupted by Maria Theresia, who renewed the town’s rights in 1774. The closing of the nearby monastery, which was an important town partner, worsened the economic situation. The industrialization in the 19th century avoided the town Kostanjevica, which helped it keep most of its rustic characteristics until today. Today, Kostanjevica na Krki is a municipality with 2500 habitants, a rich natural, cultural and gastronomic offer and a lot of sport activities, like horseback riding, boating, SUP, skike, swimming, cycling, hiking.